The first eight points of the second half belongd to Virginia. So does the pace of play. And the rebounding battle. And the momentum. And most importantly, the lead. The Cavaliers have edged ahead 36-31 with 14 1/2 minutes to go in the national semifinals. The Tigers missed their first eight shots to start the second half. They’ve been particularly bad from the 3-point arc, where Bryce Brown’s latest miss left them 3 for 19 from 3. Auburn coach Bruce Pearl dismissed any concerns about his sharpshooting team’s ability to make shots in a football stadium, saying Thursday that the rims were “soft.” They haven’t been so far. The second half between Auburn and Virginia is under way with a national title berth at stake. The Tigers were just 3 of 14 from beyond the 3-point arc in the first half, though they still managed to take a 31-28 lead into the locker room. A big reason for that was their ability to get to the rim against a Virginia defense that is designed to prevent just that. The Cavaliers are leaning on Ty Jerome, who had 13 points in the first half. Virginia center Jack Salt played only 2 minutes in the first half because of foul trouble, and that meant a short bench for coach Tony Bennett. Salt should figure more prominently in the second half. Auburn is 20 minutes away from the national title game after what might go down as one of the fastest first halves in Final Four history. The Tigers lead Virginia 31-28 at the break. But the teams burned through the first half in less than 40 minutes of real time, thanks in part to seven total turnovers and nine total fouls. In fact, there was never an under-4 minute media timeout because there was never a dead ball down the stretch. Missed shots were cleanly rebounded, neither team turned it over and there was never a blown whistle for a foul — so the teams kept on playing. 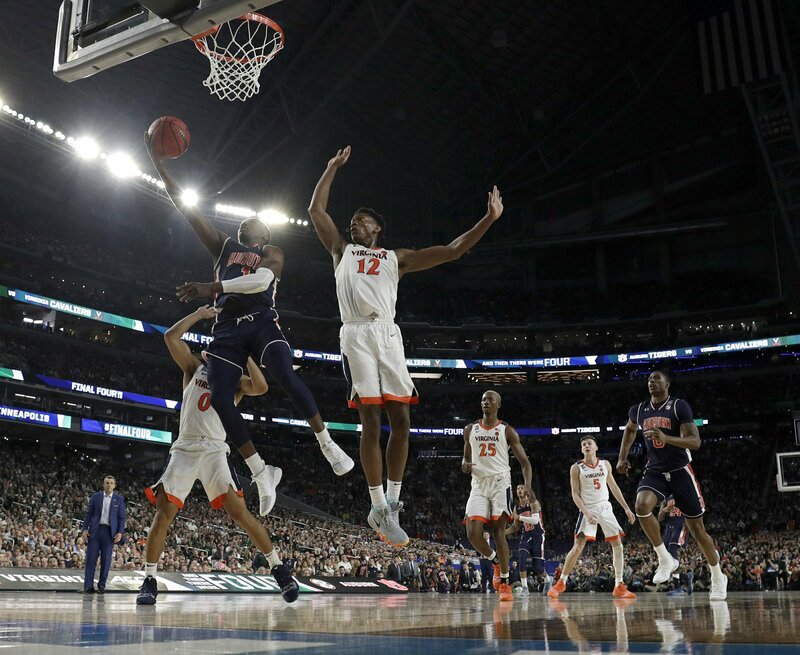 The first 10 minutes of the Final Four matchup between Auburn and Virginia is going about as expected: The Tigers are throwing up 3-pointers and the Cavaliers are slowing the pace. Worth watching, though: Virginia center Jack Salt already has two fouls. The Cavaliers figured to have an advantage in the paint with Auburn missing 6-foot-8 forward Chuma Okeke to a knee injury. But the 6-10 Salt is on the bench, where he does Virginia no good. Meanwhile, Auburn football coach Guz Malzahn got a big ovation when he was shown on the video screens inside U.S. Bank Arena.